November 22nd, 2010 by KTU | Filed under 6. Interior Materials and Finishes, Park City Mountain Modern. 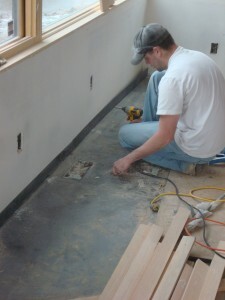 The baseboard in this house is 1/8″ x 3″ hot-rolled steel strip. It came in 20 ft. lengths and was installed with McFeely’s washer-head combo-drive screws centered on the strip. The finish carpenters did it. They were curious if not skeptical initially. By the end, they loved this stuff. There is only one seam in the entire house (on a 25 ft. wall). It went up easily. I plan to do nothing to this. Everyone likes the way it looks too. Did I mention it is super cheap ($0.60/ft or so)? 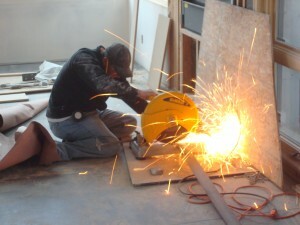 Spencer cutting the steel strip to length. Combo-drive screw installed in center of strip. Another question Karl… Did your finish carpenters do anything special with the outside corners of the baseboard?? No, we just butted them up and left them as is. I think they look fine. They did break all the sharp edges before installing the steel. I am just blown away by your house blog, and by the house! Presently designing our build for Spring ‘12 and have garnered so much invaluable ideas from your site – especially this trim! I came across your site because of the similarities in design tastes – and I believe your photo of a house by Carney Logan Burke. Thanks so much for the time you put into this site, it’s a great resource. Where can I buy this steel baseboard? I need something chew proof the edge the floors of a bird/parrot room. 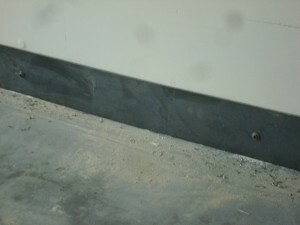 I was also considering aluminum baseboard but cannot find anyone selling it. thank you for any suggestions. This is a very standard steel shape, which any steel supplier can provide. Look up “steel” on line. Alternatively, find a steel fabricator (e.g., someone who makes steel railings and so forth) and they can order it for you. 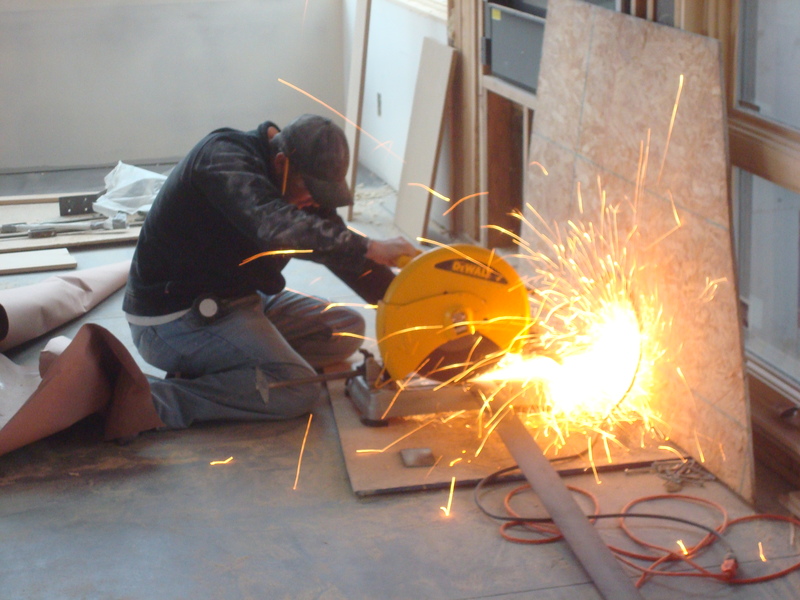 Sometimes the steel suppliers only sell wholesale or in large quantities.